Have you ever know if the smart phone device had fought to build very smartest and very friendly device. RIM (Research in Motion) proved it. The new type of BlackBerry® is BlackBerry® Storm 9500. Why in my title I said Shock it? Because this type is very nice and very smart, I think. 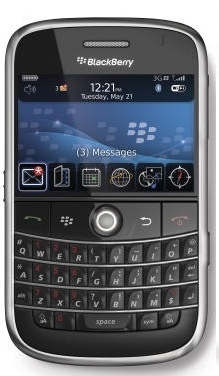 RIM still produce a high-end type of BlackBerry®, this type competes with another smart phone manufacture, such as Nokia, Apple Inc, and Sony Ericsson. They have been producing many smart phones with touch screen technology and another application that provides business need. Storm will launch with Verizon Wireless and Vodafone. This touch screen technologies is different from IPhone, because we can feel the touch when we push some commands. Therefore, we can feel every touch when we operate Storm’s applications. Be sides feel the touch, when we browsing, Storm can recognize how strong we push the button. If we touch the screen softly, we will move the cursor, and if we push the button stronger, we will send a command to click an icon. Storm has wide screen, so we can surfing more free. Now, I will show you all of the specification from BlackBerry® Storm directly. Finally on August 2008, Blackberry BoldTM 9000 officially entering to Indonesia. BB Bold had sold in Indonesia by XL package. Countries that have feel BB Bold technology are Australia, Hong Kong, and Singapore. 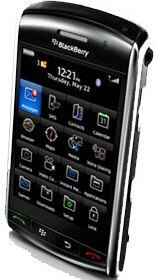 From Blackberry Bold 9000 series, Blackberry wants to show a smart phone with many useful applications that it has, such as multimedia, office application of course, completely connectivity with high-speed data access (HSDPA), Built in GPS, Wi-Fi, Browser and many others. The body covered by black glossy and chrome it is so elegant phone. To support multitasking system, this phone has a mobile next generation processor 624MHz, 128Mb flash memory, and 1 GB on-board storage memory. DataViz Document to Go bundled when we buy it, so we can editing Word file, Excel, and Power Point directly. Just like another Blackberry, it provides high secure of IT administration and mobile messaging solution.